How can the responsibility for refugees be distributed more fairly – globally and within the EU? And how can we curb irregular migration while expanding legal immigration to the benefit of all concerned? These and other questions are addressed in the first annual MEDAM assessment report, which was launched at the ‘Think20 Summit- GLOBAL SOLUTIONS’ on May 30, 2017 in Berlin, and to the Brussels audience on June 9, 2017 at CEPS. The large number of refugees and other migrants who have come to Europe over the last two years has caused the EU member states that received most of the asylum seekers, to reach their capacity limits. With a view to new arrivals and their long-term integration, it is now necessary to develop new and, above all, common strategies to address the migration flows to Europe. 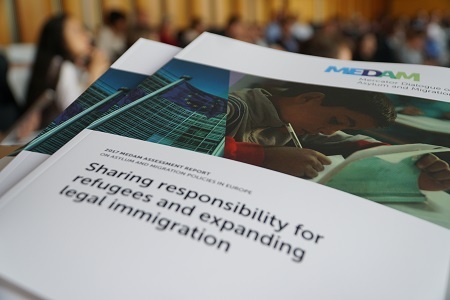 The 2017 MEDAM Assessment Report ‘Sharing responsibility for refugees and expanding legal immigration’ is the first in an annual series, and analyses key challenges in the areas of asylum and migration, and describes both the complexity of the challenges and explains their interdependencies. Focusing on two core messages, the report puts forward recommendations to address the most pressing concerns of policy makers.